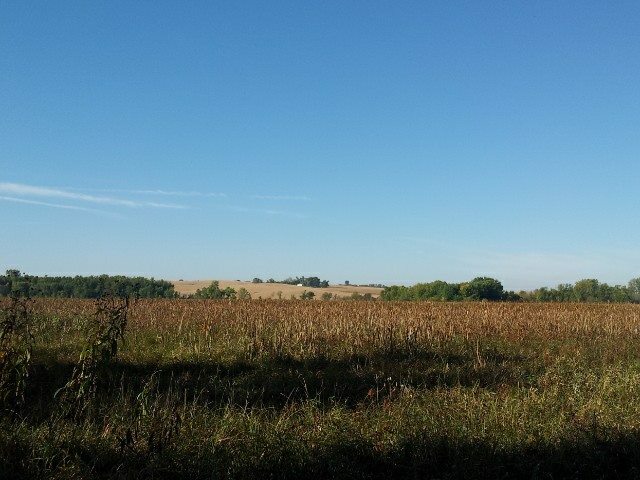 When the Iowa Ornithologists’ Union invited me out to be the Keynote Speaker for their 2013 Fall Meeting, I jumped at the opportunity to get some birding in in a part of the country that I have not spent very much time exploring. Add to that a program and book signing at Milwaukee’s Urban Ecology Center, and I had a solid excuse to work on some under-served state lists…and visit some good friends. Each day, I posted a short synopsis of my travels and birding on my book’s Facebook page. Here, I’ve simply edited those and added some photos for your viewing pleasure. 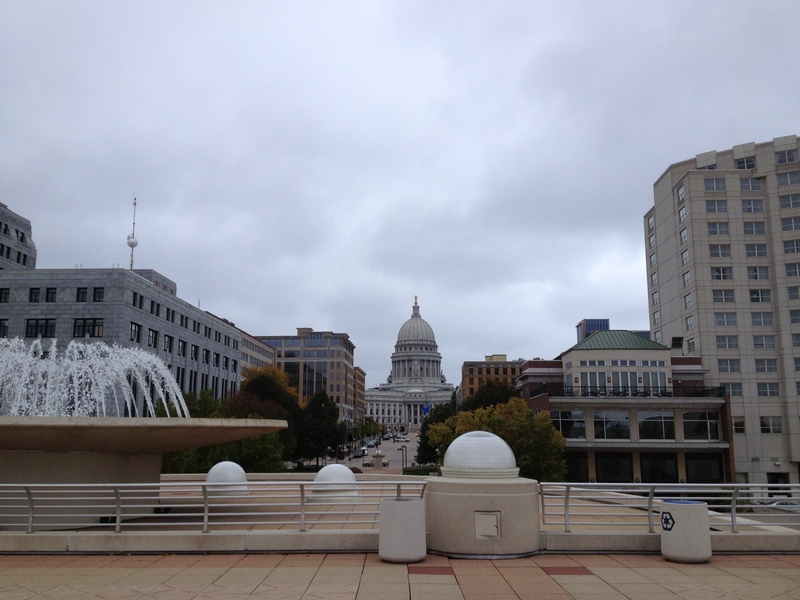 10/10: Travel to Des Moines, Iowa. Departing Portland at 6:14am. 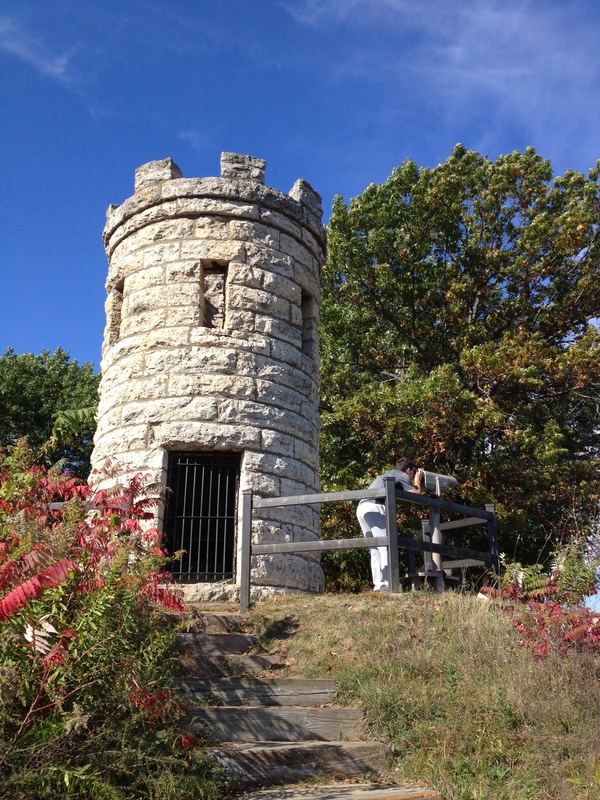 On my way to the Iowa Ornithologists’ Union‘s Fall Meeting, I spent the first day and a half of my trip birding the Des Moines-Ankeny area with my friend Danny Akers, the 2009 Bradbury Mountain Spring Hawkwatch Official Counter. I had hoped for Smith’s Longspurs to fill in a gap on the ol’ life list, but unfortunately, we came up empty, despite a few miles of walking up and down short-cut fields at a couple of locations. While a stiff southerly wind has not helped, they just don’t seem to be “in” yet. Unseasonably warm temperatures – a high of 78 yesterday for example – has likely put quite a few fall arrivals behind schedule. A nice consolation prize for me, however, was a fair number of LeConte’s Sparrows – a bird I really like, but don’t get to see too often. Other birds that were a treat for me include Franklin’s Gull, Sedge Wren, Red-headed Woodpecker, and American White Pelican. Our best bird, however, was probably the Pileated Woodpecker at Waterworks Park in Des Moines – a long overdue Polk County bird for Danny. But as always, I just flat out enjoy birding new places. And since I’ve only barely birded Iowa once before, my state list is growing by leaps and bounds. I was not too happy that I was unable to bird the famous Saylorville Reservoir, however, thanks to the government shutdown. John Boehner: you owe me some state birds! We then headed east towards Clinton, where Danny and I would be leading a field the next morning. I very much looked forward to seeing what might be moving behind this approaching cold front. While it might not clear in time for a flight tonight, Sunday morning could be a lot of fun. Looking for Smith’s Longspurs at Chichaqua WMA. 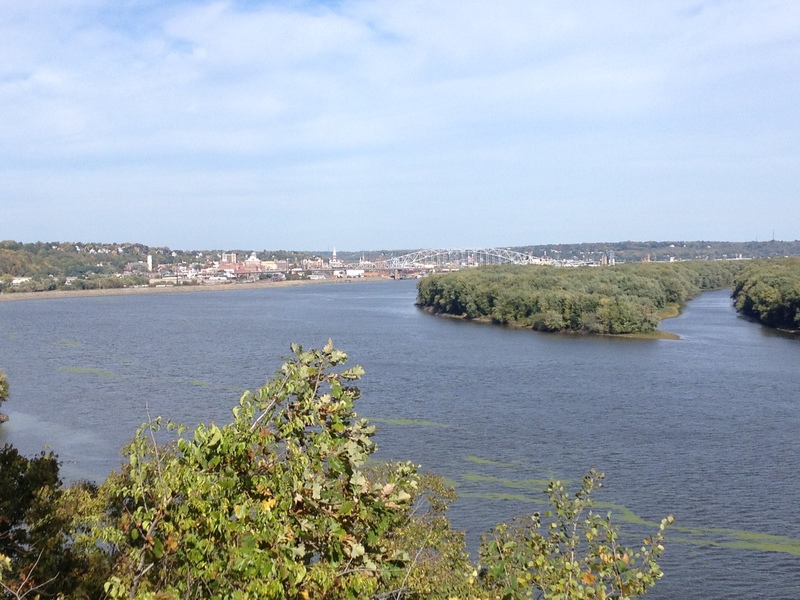 10/12: Clinton, Iowa – Iowa Ornithologists’ Union Fall Meeting. Danny and I led a field trip this morning to Princeton Marsh here in Clinton, IA. We had a great turnout – I was honored! – of birders. I just wish there were more birds than mosquitoes! Few migrants were around in the morning; there was no morning re-determined migration today. The approaching cold front took its sweet time in getting here, and had not pushed through easternmost Iowa by dawn. It was interesting to see the huge flight on the Des Moines radar overnight, just west of the front, compared to the Davenport radar, just east of the front (where we were). So the woods were quiet, but we had ample numbers of things like Yellow-rumped Warblers, both kinglets, and lots of Red-winged Blackbirds commuting overhead. A heard-only Pileated Woodpecker and a good look at a Winter Wren were local highlights. Oh, and I got a life frog: Cricket Frog! And lots of Leopard Frogs were around; it was not a good sign that I was ranting about bush honeysuckle and playing with frogs within the first 30 minutes of the walk. A scrubby, weedy wetland area near the southern edge of the property was much birdier, however, highlighted by a teed-up LeConte’s Sparrow, 7 Wilson’s Snipe, and a Sora. A small group of 5 Eurasian Tree Sparrows were a little unexpected. The front had now pushed through, dropping just a few sprinkles, but also blowing away the skeeters. That was nice. Danny and I decided to try a little river migration watching, so we headed over to a small riverfront park in Princeton that intrigued us during a quick visit yesterday. Now we were in business! A trickle of raptors began to move overhead, as soon as the clouds cleared. A handful of Sharp-shinned Hawks, a Merlin, a few Red-tails, etc. A group of about 30 Franklin’s Gulls sitting on the sandbar took flight, soaring high and perhaps southwards. As we were about to depart, a line of 32 American White Pelicans came cruising down the river. Yay, migration in action! In the afternoon, I presented my Russian Far East: In Search of the Spoon-billed Sandpiper program. Yeah, I apologize I went a little long there. Oops. But it was such a great experience to share, and really, is there ever such thing as too many Tufted Puffin pictures? Home base for the Meeting. 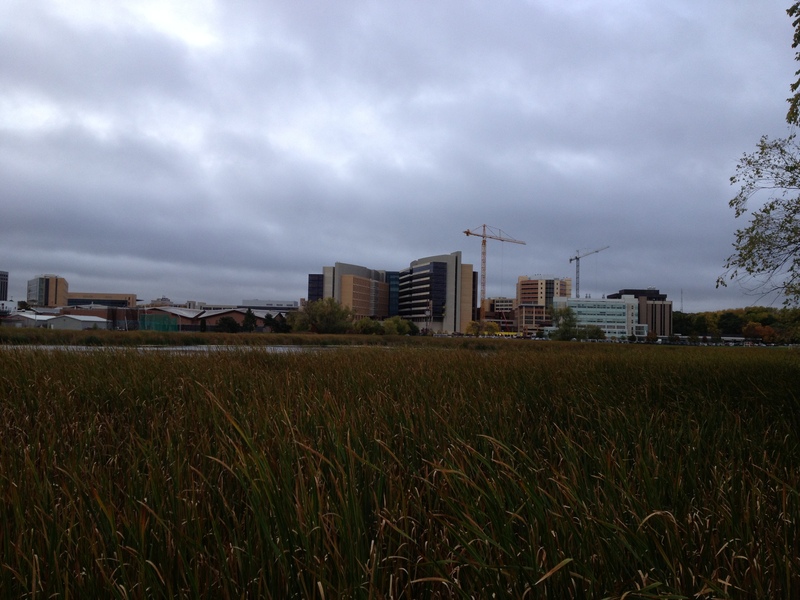 Early morning in Princeton Marsh. What a difference a day makes! A very strong flight took place overnight Saturday into Sunday, and a lot of birds arrived for Sunday morning. Not only was I very happy to see a lot of birds on our field trip to Princeton Marsh, but I was happy to see that my predictions came to fruition. Following my evening program “A Sandy Point Case Study,” in which I concluded with a little local radar analysis, I predicted it was going to be a good morning (it’s always a risk sticking one’s neck out like that!). And it certainly was at Princeton Marsh at least! Large numbers of Yellow-rumped Warblers were reorienting overhead at dawn, and new arrivals included Palm Warblers and Fox Sparrow. Some waterfowl also arrived with Blue-winged and Green-winged Teals, and Gadwall becoming new entries in my state list. 2 Nelson’s Sparrows joined two LeConte’s Sparrows; both species were seen very well by all, and Nelson’s is fairly rare around here. Very local in Iowa, a conspicuous Pileated Woodpecker was enjoyed (a lifer for some, actually), as was a spiffy adult Red-shouldered Hawk. But the bird-of-the-day was a very truant adult White-faced Ibis that was foraging in a shallow wetland. A great morning of birding concluded a most enjoyable and productive weekend for me. 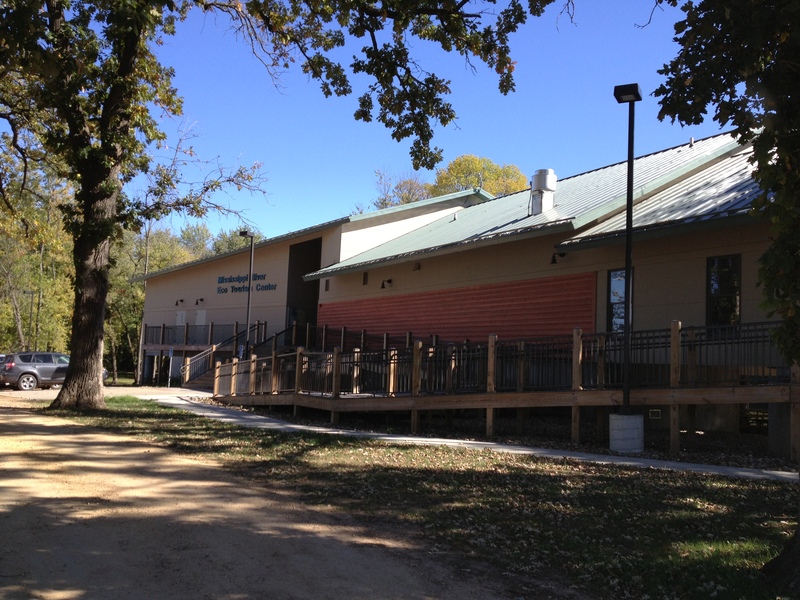 I thank the Iowa Ornithologists’ Union for having me out, and I hope to see you again soon! Danny and I headed north this morning. Our first stop was the Goose Lake WMA. 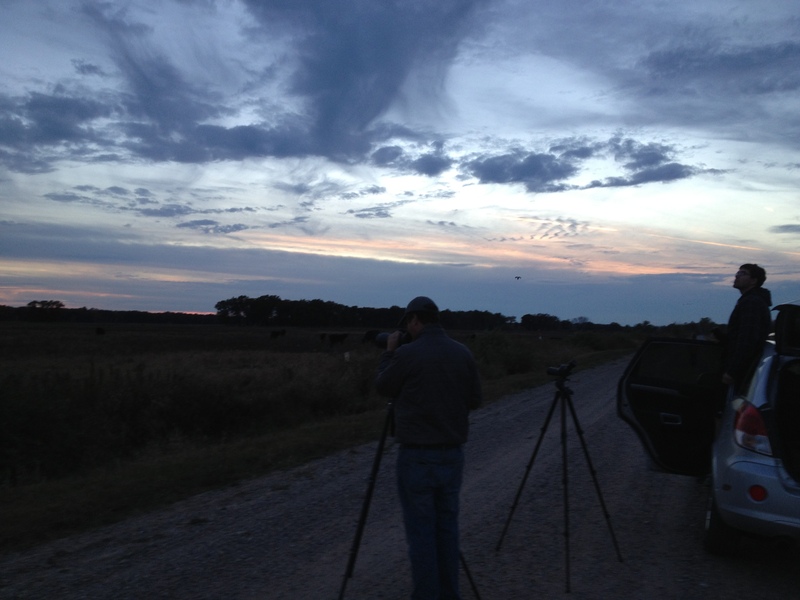 After another good flight on the radar overnight, we found a lot of birds here. American Robins, White-throated and Swamp Sparrows, Red-winged Blackbirds, Cedar Waxwings, and Song Sparrows were all abundant, trumped only by the cloud of 500+ Tree Swallows. A flock of Rusty Blackbirds were in the marsh, along with a single Ring-necked Duck – the last two new species for my Iowa list of the trip. The highlight for me, however, was the 60+ Wilson’s Snipe that joined ~25 Killdeer on a mudflat in the marsh; I’m not used to seeing so many snipe together. We then drove to Madison, Wisconsin, picked up David La Puma and new friend Jessica Gorzo, and – in what, in hindsight was not a great idea – raced north to chase a long-staying White-tailed Kite. Not that an occasional chase with friends is a bad idea, but the fact that we were essentially racing the sun made us reconsider this. Arriving in the area with about 30 minutes to sunset didn’t provide much hope, but an ultra-distant male Northern Harrier hovering over a field did – at least for a little while. Flocks of Sandhill Cranes were heading to roost, as was a massive cloud of Canada Geese. No small – in my mind – consolation prize, however, was the flock of about 30 Greater Prairie-Chickens that I spotted as they flew just over the tops of a field, before disappearing into the grass. Although known to be here – and intensively managed for them – they are not often seen, especially at this season, so that was a real treat for me. Having seen Greater Prairie-Chicken many fewer times than White-tailed Kite, I left satisfied. Mostly. “I think it’s too late” – All of us. Danny said goodbye and took off in pursuit of the White-tailed Kite once again (unfortunately, despite many people looking it was not seen, and has never been seen again. Apparently, we missed it for good by exactly one hour). David and I wished him luck, but we thought our time would be better spent birding locally in Madison before heading over to Milwaukee. The Pheasant Branch Conservancy was our destination – after a ridiculously late start for all (our respective travels had clearly caught up with all of us!). 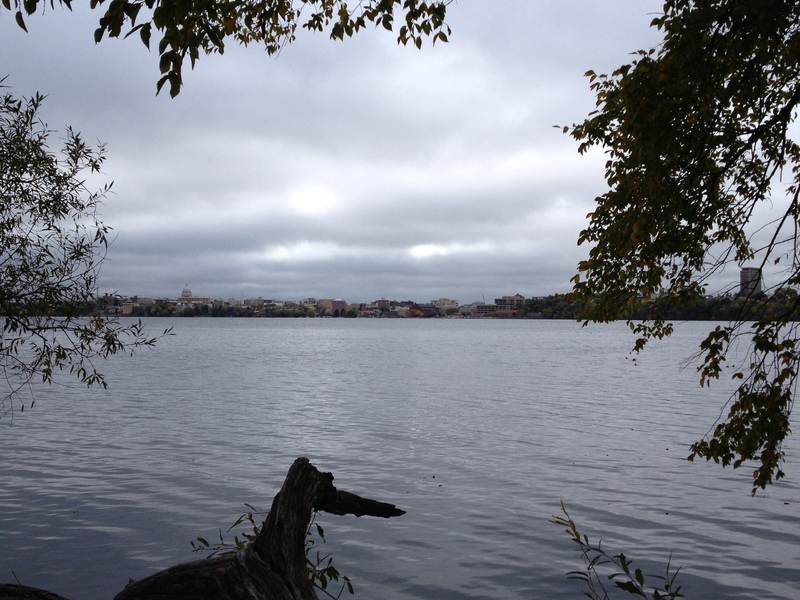 While the radar did not suggest that this was a morning that could not be missed, we probably – it’s October afterall – should have motivated sooner, but sometimes the body makes such decisions for you. 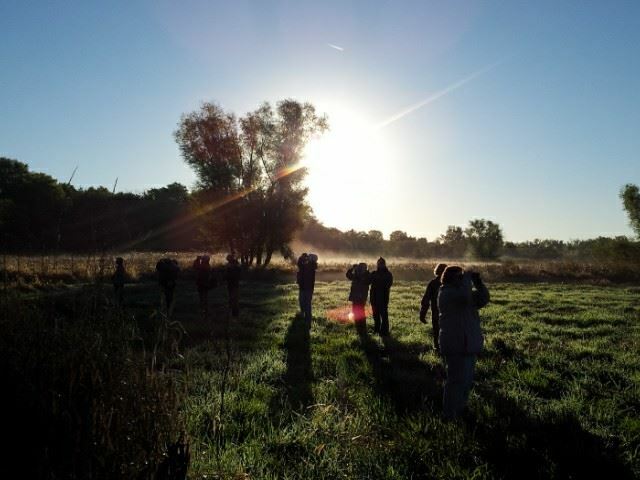 However, even in the middle of the morning, this Middleton preserve was decidedly birdy! It was full of sparrows, and my paltry state list grew by leaps and bounds. Fox Sparrows had arrived, White-crowned Sparrows were in good numbers, and plenty of White-throated and Song Sparrows were to be found, along with a goodly number of Lincoln’s Sparrows – one of my favorites! 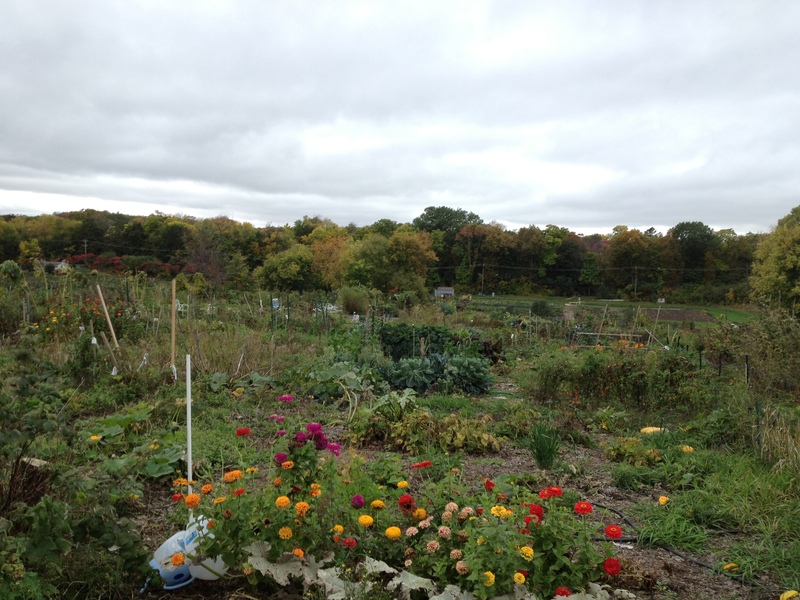 Before we knew it, however, it was time to head to the Urban Ecology Center for my evening program. At a pre-presentation dinner, it was great to meet some new friends, and get re-acquainted with some of the people who joined me (OK, technically, I joined them) aboard the UEC’s private charter aboard the Schooner Lewis R. French out of Camden, ME last summer. They were stuck with me for 5 days yet came back to hear me talk even more, so I guess that is a good sign! I wanted to thank Tim Vargo of the Urban Ecology Center for inviting me over, and I thank everyone who came out last night. I hope you all enjoyed the show! 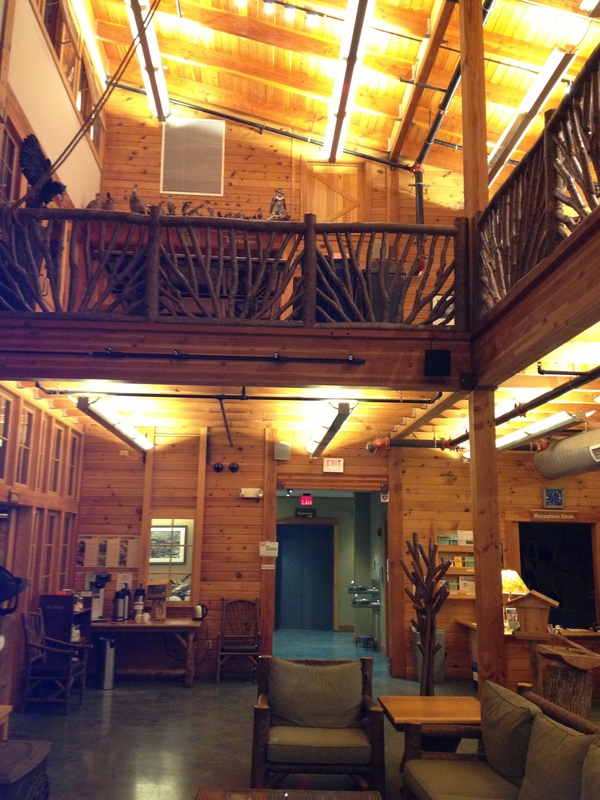 Inside the Urban Ecology Center. Following my Sandy Point Case Study presentation at the IOU Meeting over the weekend, I looked at the local radar with the group and suggested it would be a very good morning in the field. And, in most places, it definitely was. After my Urban Ecology Center program last night, we looked at the radar and saw virtually nothing that suggested bird migration. David chastised me a little bit for even hinting that “no migration on the radar” means “don’t go birding in the morning.” “It’s migration – go birding every morning!” (My point in the progrAm was simply that I would not have gone to Sandy Point that next morning). And he’s absolutely right. There are plenty of birds around in mid-October even when they have not moved in the night before. While there might not be a Morning Flight of note without many “new” birds, there are plenty of birds in the field – literally. 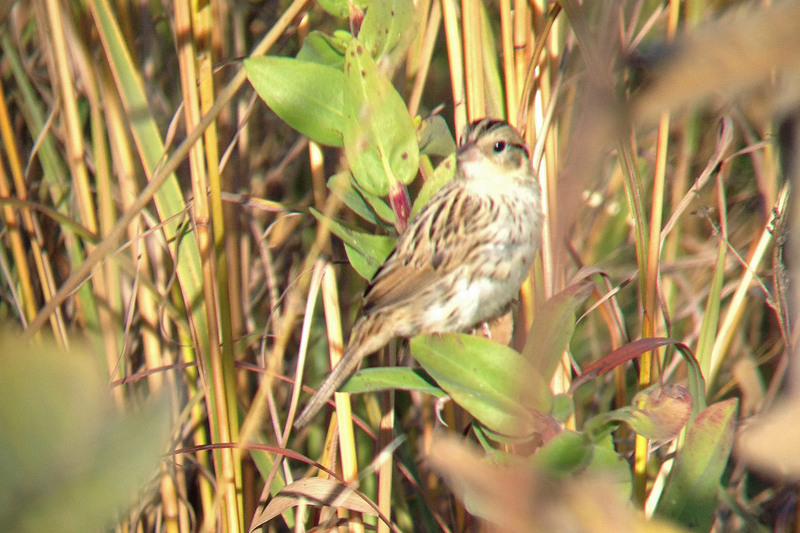 It’s sparrow season, and just to prove the point, local Madison birding once again proved why you go birding every day in migration! First, we walked through the woods from David’s neighborhood to the 1918 Marsh. Not much happening. A walk around and through the marsh, out to Picnic Point. A little dissapointed by the low numbers of sparrows, we instead enjoyed a nice little sampling of newly-returned migrant waterfowl (Northern Pintail, Bufflehead, Gadwall, American Wigeons, and Redhead), and lots of American Coots. Coots always amuse me. And drake Wood Ducks are always worth and extended view. Readers of my blog and the store’s Facebook Page know I am a big fan of birding community gardens in the fall, so you could image my glee when we exited the Biocore Prairie (which itself had a goodly number of sparrows) and I stepped into the acres of the Eagle Heights Community Garden. This is where all of the sparrows were! 400+ House Sparrows, 150+ American Goldfinches, 100+ White-throated Sparrows, 75+ Song Sparrows, 50+ White-crowned Sparrows including one of the western subspecies Gambelli. A couple of dozen Lincoln’s Sparrows and Dark-eyed Juncos. A smattering of Field Sparrows, Yellow-rumped Warblers, and Chipping Sparrows. A handful of Palm and Orange-crowned Warblers, 1-2 Fox Sparrows, and my 100th Wisconsin Bird: 2 Brown-headed Cowbirds. Times flies (as in almost 3hrs here!) when you are having fun! University of Wisconsin from 1918 Marsh. This was my last day of birding of my little Midwest trip. After David and I hit the Eagle Heights Community Garden in Madison (more juncos and Chipping Sparrows, 1 Nashville Warbler, multiple Orange-crowned Warblers, a late Ruby-throated Hummingbird, a continuing “Gambell’s” White-crowned Sparrows, etc), I hit the road for Minneapolis. 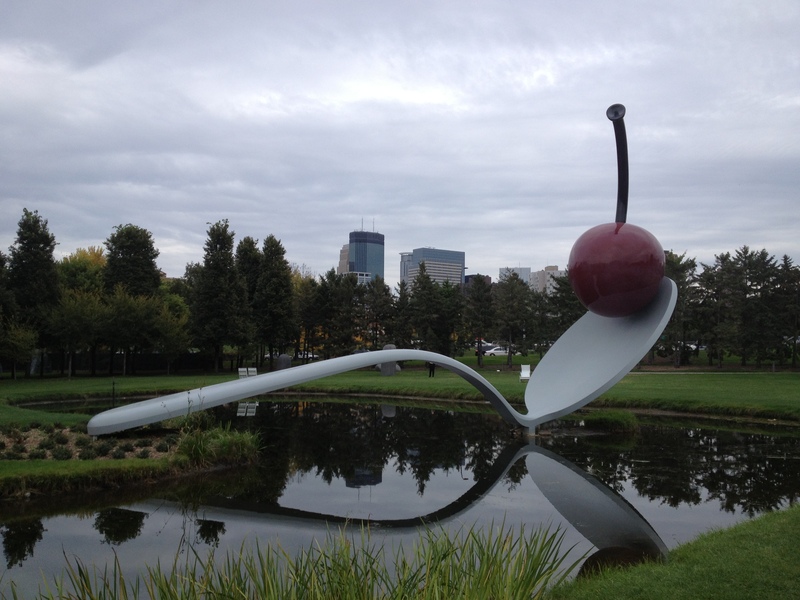 Visiting a non-birding friend – yeah, sometimes I tolerate hanging out with people that don’t like birding – my birding was limited to a walk around LoringPark and the art museum’s SculptureGarden. White-throated Sparrows were quite common, with a fair number of Dark-eyed Juncos, Swamp Sparrows, and a couple of Lincoln’s Sparrows. There was actually a reasonable diverse selection of migrants in this small, very manicured city park. 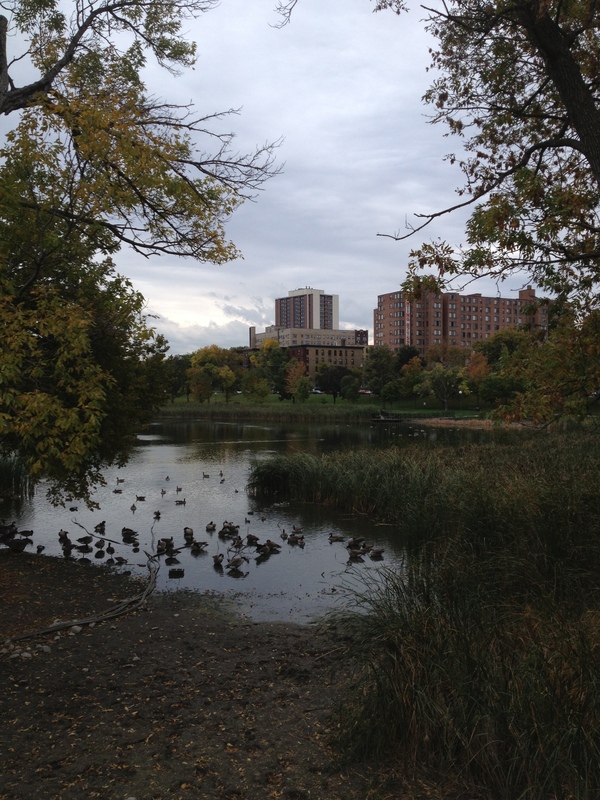 And I do love city park birding! 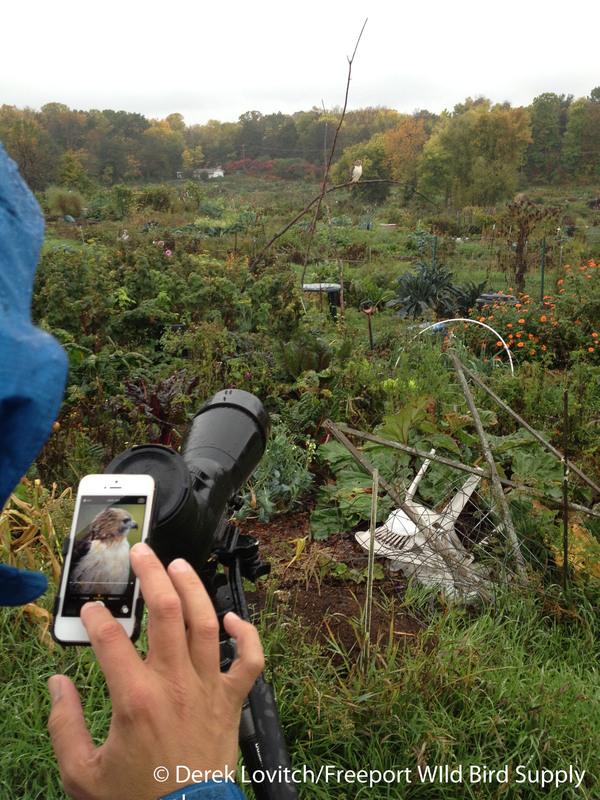 a href=”https://mebirdingfieldnotes.files.wordpress.com/2013/10/n-rtha1.jpg”&gt; Quite possibly the world’s most cooperative Red-tailed Hawk in the Eagle Heights Community Garden. This is just a standard photo with my iPhone. David works on some phone-scoping. As much as I love to travel, I love to come home even more! It’s good to be back, but I thoroughly enjoyed my time birding, visiting, and chatting about “How to Be a Better Birder” in Iowa and Wisconsin. 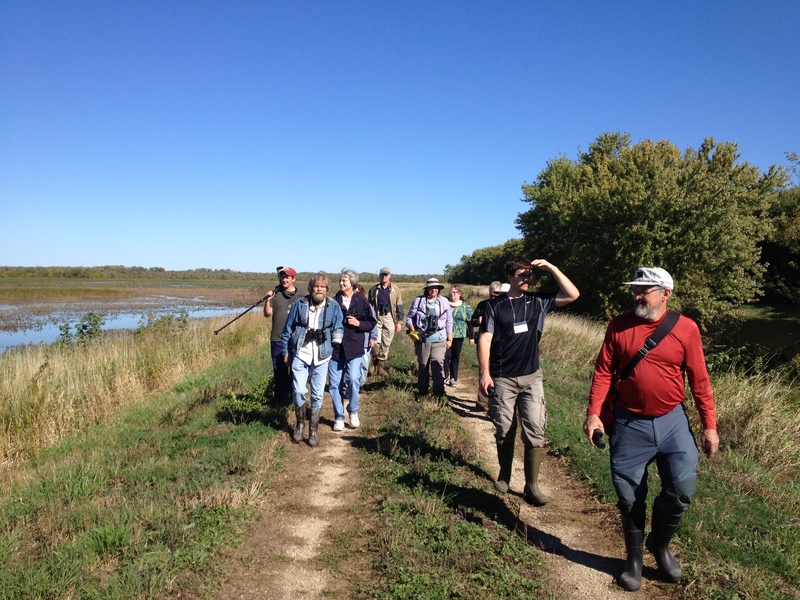 Thanks again to the Iowa Ornithologists’ Union, Tim Vargo at the UrbanEcologyCenter, Danny Akers, and David La Puma for making this tour happen. Next up, New Hampshire Audubon in Concord on 10/24. This entry was posted in Birding "Away" and tagged Birding, Eagle Heights Community Garden, Iowa, Iowa Ornithologists Union, LeConte's Sparrow, Madison, migration, radar, Red-tailed Hawk, sparrows, Urban Ecology Center, Wisconsin on October 20, 2013 by Derek.